Leia Hart, MS is a counselor, healer, and teacher of cross-cultural shamanism, energy medicine, and family and systemic constellation work in Eugene, Oregon. She has been in the Transformational Healing Arts since the 1980's, and has studied many modalities and healing energy systems creating a synthesis of ancient esoteric knowledge and vibrational spiritual medicine. Her calling is to work in partnership with the Helping Beings, to assist the living, those in transition, and those who have crossed over. In an environment of safety and loving support, Leia will guide you through a powerful healing journey that serves as a catalyst for transformation, redirecting creative energies from the pain of the past to the healthy needs of the present and future. Leia incorporates various healing methods that assist the client in healing wounds and memories, shifting from merely surviving to a thriving, vibrant life! Some of these same traditions are useful in assisting individuals in the sacred art of dying consciously. The use of Flower Essences and essential oils may be used in conjunction with the work. Flower Essences and aromatherapy may promote emotional ease, mental clarity, physical vigor, and spiritual awakening. For many years, Leia loved teaching in the schools by day and having her healing practice in the afternoons, evenings, and weekends. Now Leia is able to devote full time to her vibrant healing practice with children, teens, and adults. Leia has a vast healing background combining extensive experience, apprenticeship and exploration of Eastern and Indigenous mystical spiritual traditions with many profound teachers in the U.S. and abroad. Leia has been blessed to study with many indigenous shamans including Tohei Sensei in Japan, Jose Luis Herrera, Reuben Orellano and Theo Paredes in Peru, Aama Bombo in Nepal, and Kaballah mystics in Israel. Leia has studied 21st Century Shamanic Healing extensively with Sandra Ingerman, since 1992, including Soul Retrieval and The Two Year Teacher Training in Shamanic Healing. In addition, Leia has studied with Betsy Bergstrom (Compassionate Depossession, Curse Unraveling, Compassionate Depossession Teacher Training), Tom Cowan (Celtic Shamanism), Carol Proudfoot (Bear Medicine) and in the 1990's with Michael Harner (The 3-Year Program in Advanced Initiations in Shamanism and Shamanic Healing, and The 2 week Shamanic Healing Intensive) and The Foundation for Shamanic Studies. Leia is an life long student in Tibetan, Chinese, and Ayurvedic Medicine, Medicinal Plants, Essential Oils and Spiritual Evolution, currently studying advanced aromatherapy with David Crow. Completed Family Constellation, Community, Organizational & Nature Constellation 7 month Facilitator Training ﻿with Francesca Mason Boring. 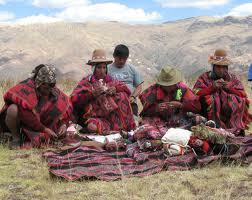 Leia is an initiated Mesa Carrier in the Inka Tradition, a Tibetan Buddhist practitioner, and a Reiki Master Teacher. Leia is an ordained Minister of the Circle of the Sacred Earth, a member of The Foundation for Shamanic Studies, and The Society of Shamanic Practitioners.